Stunning Brick Beauty in Celebrate! 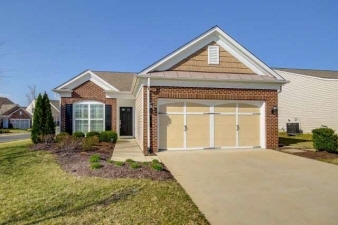 Jefferson Model on a Corner Lot! The community amenities at Celebrate, a Del Webb Community, are truly spectacular. The 30,000 square foot Clubhouse offers indoor and outdoor pools, gym, banquet room, billiards/bar area, card room and craft room. -Club house - indoor/outdoor pool, gym, billiards, banquet room with professional kitchen over 30,000 sq. ft.
Additional Features and Amenities Come live the great life in a community like no other! With many amenities, resort lifestyle and ease of living, this property in Celebrate is a must see! If you are tired of the yard work and are looking for a relaxing lifestyle, this is it! This upgraded Jefferson Model features 2 bedrooms and 2 bathrooms and over 1,384 square feet of living area! It has just enough space for your treasures but easy to maintain. The beautiful curb appeal draws you into this home and the charm doesn't stop when you get inside. The foyer is welcoming with wainscoting and crown molding and the beautiful hardwood floors continue through the main living area. You will love the open floor plan between the living room, kitchen, and dining room. There is plenty of natural light plus overhead recessed lighting.